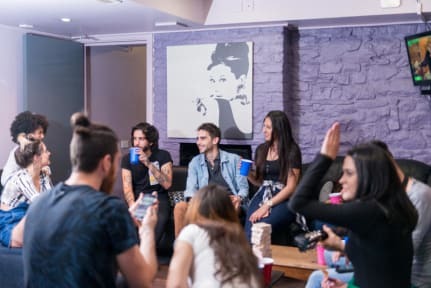 We're a friendly, safe, clean and cosy backpackers' hostel located in Dublin's trendy nightlife district just off Camden Street in the heart of Dublin's city centre. We're a five-minute walk to Grafton Street, St. Stephen's Green and St. Patrick's Cathedral and a ten-minute walk to Temple Bar and Trinity College. There are many restaurants, shops, bars and clubs just around the corner. You'll never be short of things to do here! Come stay with us and enjoy tons of free stuff, including fast free Wi-Fi and daily events. You can get a coffee break 24hrs a day, with free tea, coffee and hot chocolate at any time. There's no curfew either! We offer free breakfast, free luggage storage, a big kitchen to cook in, a lounge with TV, book swap and board games. Our free weekly events include Games Night on Tuesday, free hot dogs every Wednesday (yummy! ), free welcome drinks on Friday night and free pancakes on Saturday morning. There's a free walking tour of Dublin every day, plus pub crawls every night! As if that's not enough, you can get free hugs anytime! We want all our guests to have a great visit to Dublin! Our friendly and experienced staff are on-hand 24hrs a day and are happy to help you out with questions, ideas, discounts to tourist attractions and all the ins and outs and sights of the city. We can guide you to the best restaurants, pubs and clubs in Dublin. Many of them are just around the corner! Linen is free (yes, we'll make your bed), beds are clean and comfy, luggage and laptop storage is free, and you'll find free city maps and tour information at reception. Choose between eleven room types, including dorms with ensuite bathrooms/shared bathrooms, female-only dorms, private doubles/twins with ensuite/shared bathrooms. We're tucked away in a side street just off of Camden Street. Dublin buses and LUAS (Dublin's light rail system) are right outside our door. The 16A bus (one minute away) will take you straight to-and-from the airport. Other shuttle buses are running from and to the airport all day nearby our hostel - just ask! Come stay with us at The Times Hostel - Camden Place and enjoy all that Dublin has to offer! All guests must present a credit or debit card in there name upon arrival to the hostel. We reserve the right to pre-authorise your card prior to arrival.